Saturday was one of the hottest days of the year so far, and things certainly heated up in the home economics classroom at Leith Academy. It was the inaugural Mexican Cookery class – part of Leith Academy’s adult learning programme – and my first one-day cookery class. Having bought what seemed to be enough ingredients to feed a family of four (Mexicans) for two weeks, I loaded up my very kind boyfriend Rob like a packed donkey and we carted ourselves over to the school. In hindsight, it would have made a lot more sense to take the class with some friends, as most of the other attendees had, so I could have shared the ingredients and spread the cost. But hey, you go to school to learn, don’t you? The class was taught by the very personable and knowledgeable Sara, who gave us all a little insight into the type of food real Mexicans eat when at home. The idea behind the class, she said, was to tackle misconceptions about Mexican food – and the colourful menu did just that. Interspersed with cooking tips, were facts about the ingredients and little quips about everyday life in Mexico – I feel like I came away with much more than simply the experience to create some great Mexican dishes. Apparently Mexican food is one of two UNESCO world heritage cuisines, the other being French. Mexican food is also one of the world’s first fusion foods – following the Spanish invasion Mexico was used as a port between east and west, so there is a strong Arab influence, plus Indian and Caribbean flavours. Sara showed us a large lump of chocolate, which looked more like a brown patty than the slick packaged stuff we’re used to, and explained that was what she ate as a child for a treat. Real chocolate doesn’t contain any of the sugar like ours does, and has a more bitter taste. Without a fajita or a burrito in sight, we started with the main course since it needed to marinate and then spend a few hours in the oven – pork baked in banana leaves. The meat was smeared with all manner of deliciousness, including dried chilli pequin, and achiote paste. Achiote is an aromatic spice made from the seed of a tree in the Caribbean, and while smelling lovely…dyed my fingers, skin and clothes a rather fetching shade of bright orange! Once the pork was ready, we folded it into a parcel of banana leaves – I got mine at the Chinese supermarket on Leith Walk – and apparently they were the most impressive banana leaves ever, they were almost as tall as me! Cooking the refried beans proved pretty easy, and Sara said refried beans with chorizo or bacon spread on toast is a typical breakfast in Mexico – sounds good to me. Making the tortillas was most fun. Authentic tortillas are much smaller than the ones we buy in the shops over here, by about half the size. The trick was to get the dough just the right consistency, so that it stuck together and didn’t break when you pulled it apart. Traditional tortillas are made with maize flour, which is gluten-free – I’ll be making these for my mum. I got a little bit of a rhythm going with my tortilla making, so while one was cooking I was busy flattening the next one. 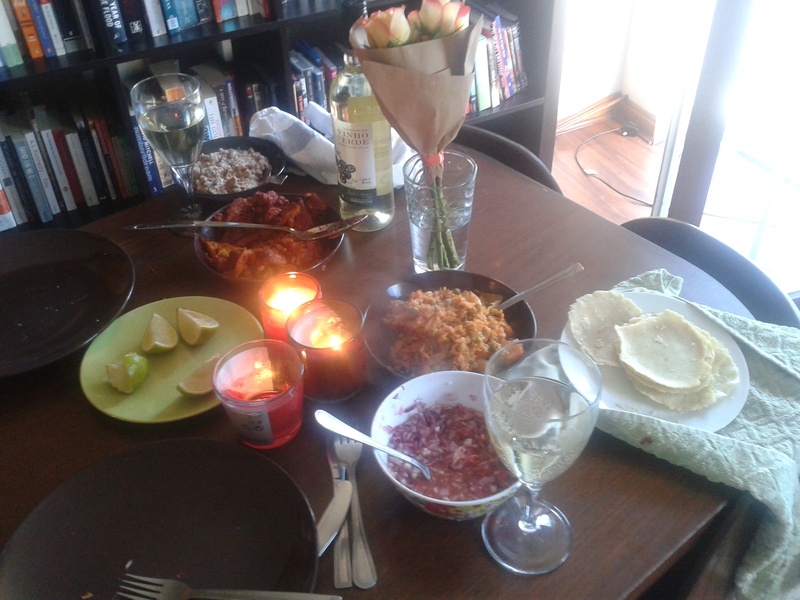 Additionally we made some tasty Mexican rice and onion salsa with real kick (hello, scotch bonnet). Finally – and in my pudding-loving-mind, most importantly – came the Torrejas Mexicanas – stacks of yumminess made from bread and manchego cheese covered in beaten eggs then deep-fried. Later I served with a vanilla crème sauce, sprinkled with flaked almonds and cinnamon. Heaven.